Little is known about the prehistory of the area except that the Uncompahgre Utes, also known as the Tabeguache, were the most dominant native people in the Florissant Valley during early European/American colonist settlement of the area. Culturally modified trees bear witness to their inhabitance of the region, confirming that the Uncompahgre likely knew about Florissant fossil wood. The Homesteaders Act of 1862 was a watershed moment in the settlement of the American West, spurring new populations, and native dispossession, of the Florissant Valley. "I must admit that congress in its infinite wisdom has not seen fit to pass legislation protecting fossil beds in general. However, if someone had found the original Constitution of the United States buried on his land and then wanted to use it to mop a stain on the floor, is there any doubt they could be restrained?" In 1867, the Rocky Mountain News alluded to silicified wood near Florissant, but the first specific historical record mentioning the Florissant stumps dates to 1869. As early as 1876, landowners of the Big Stump (P-16) Adam & Charlotte Hill explored the idea of sending the stump to the Centennial Exhibition in Philadelphia. Estimated at over 60 tons, specimen P16 had scaffold erected around it in 1880 to cut the stump into more manageable sections to send to the Columbian Exhibition of 1893 in Chicago. This attempt failed because of the difficulties of sawing the hard lithified wood. The site was also busy with palaeontologists who worked with locals in excavating Florissant’s more famous resource, its shale beds laden with high-resolution fossils. It was also recorded that professors from Colorado College took Florissant wood away by the wagonload. 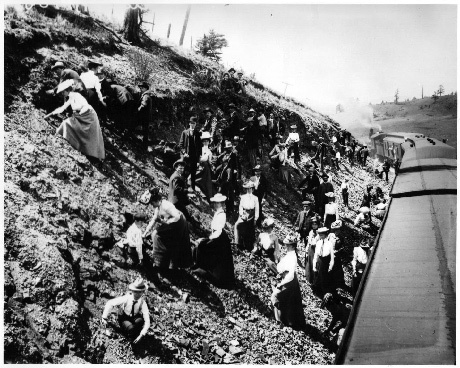 Further commercialisation of paleontological resources expanded when the Colorado Midland Rail established a station at Florissant in 1887, further enabling tourists to take shale-split fossils from trains originating from Colorado Springs. It is very unfortunate that inexperienced collectors throw away many valuable specimens, looking only for conspicuous ones, while from time to time very fine things are preserved by the non-scientific as curiosities and are eventually broken or lost […] in spite of the richness of the field it is impossible to have any assurance that species so represented will ever be found again […] To lose or destroy them is like removing a brick from some splendid building; the building will not fall, but the offense is intolerable. 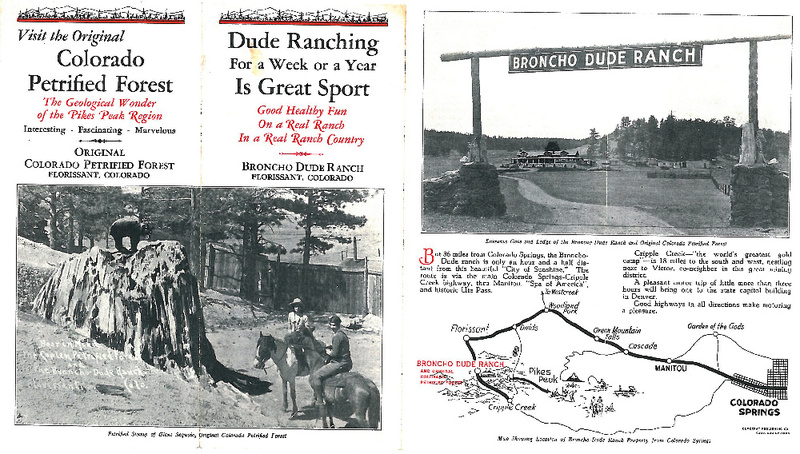 Later families exploited the tourist potential of their land, and their facilities included a lodge with a petrified tree fireplace, display cases of collected fossils, and had an ancillary function as a dude ranch. In 1918 the Cripple Creek Touring Company uncovered three large stumps, perhaps in response to dwindling tourist drawing resources, but also to compete with the income generating tourist attraction that the Coplen family had developed. 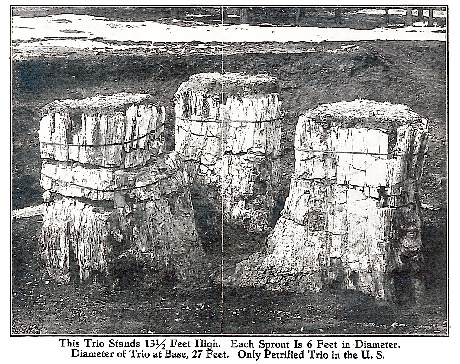 These stumps were speculatively curated in 1922 by property owners David and Ira Henderson on land to the south of the Coplen Petrified Forest and Big Stump and developed what would become the competing tourist attraction named the New, then Henderson, and finally Pike Petrified Forest. Their efforts were rewarded with the highlights ‘Trio’. These are very dramatic stumps, one over 4.1 metres in diameter, and the Trio being a clone with three trunks like no other in the world. It has been anecdotally noted that dynamite was used during the excavations, and while there is insufficient archival evidence to confirm it's use, it may explain the universal cracking found on these specimens. 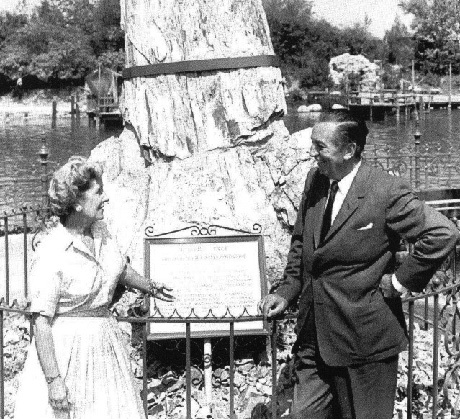 Walt Disney visited the site in 1956 and purchased a large stump for $1,650. This five ton stump remains on display in Disneyland’s Frontierland in Los Angeles today. In the Summer of 1969 the Colorado state court in Denver heard one of the first strictly environmental legal cases. 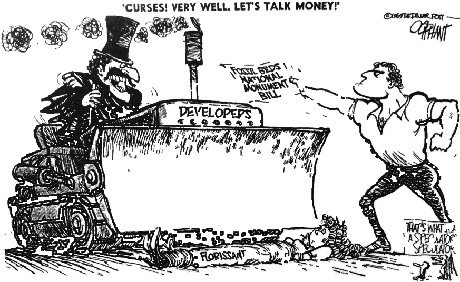 Relations were heated between the Defenders of Florissant, Inc. and real estate developers wishing to turn the valley with its enormous collection of fossils into a housing development. There is no doubt that the primary source of heritage value at FLFO is its paleontological resources, and for this reason the lawyer Victor Yannacone argued that to bulldoze Florissant fossil lands would be akin to, “using the rosetta stone for grinding corn.” Florissant Fossil Beds National Monument was officially enacted in 1969. Over time, touristic display at the Pike Petrified Forest, and with NPS control, involved various podiums and walkways, including two different podiums directly on top of P46, and later the NPS crater walkway named the “Then And Now Trail” from the 1970s. In the late 1990s the most vulnerable stumps, those excavated by dynamite, were enclosed in temporary Yurts until permanent wall less shelters were erected. The old Pike Petrified Forest building became the NPS Visitor Center, which was demolished in 2011 to make way for the contemporary visitor, research, and maintenance complex.